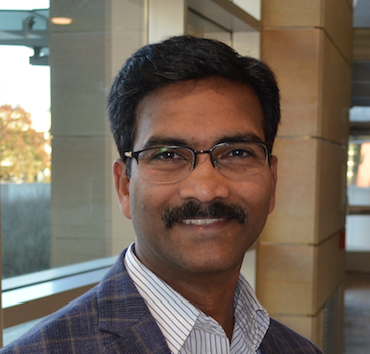 UNMC › Genetics, Cell Biology and Anatomy › Faculty & Staff › Research Faculty › Chittibabu (Babu) Guda, Ph.D.
Our laboratory nurtures a wide range of research projects related to Genomics, Bioinformatics, Systems Biology and Personal Medicine. The major research projects in my laboratory can be grouped into three broad areas: (i) Development of novel algorithms for analyzing different types of biomolecular data, followed by experimental validation and development of software and web application tools; (ii) Building data analysis pipelines for processing a variety of high-throughput ‘omics’ datasets (ExomeSeq, RNASeq, ChIPseq, methylation data, miRNA arrays and proteomics data); and (iii) Cancer genomics projects that involve integrative data analysis of molecular data across large populations, identification of molecular subtypes of cancers and functional characterization of genes and gene products identified from these studies. Some of the current research projects in my lab include analysis of breast, pancreatic and glioblastoma cancer genomics data obtained from The Cancer Genome Atlas (TCGA) project, development of novel tools for detecting fusion genes and tumor heterogeneity, and metagenomic profiling of human microbiomes. For more details on specific research projects, please visit our laboratory webpage. Our laboratory also manages the Bioinformatics and Systems Biology Core facility at UNMC. The Core provides services on a pay-per-use basis to over 60 independent investigators, most of whom are NIH funded. Click here for more details on the type of services offered through the core. The Core is also a part of several collaborative projects on campus that include supporting the Data Coordination Center for National NeuroAIDS Consortium and Bioinformatics Core for the INBRE network. Wang X, Guda C. (2016) Integrative exploration of genomic profiles for triple negative breast cancer identifies potential drug targets. Medicine (Baltimore). Jul;95(30):e4321. doi: 10.1097/MD.0000000000004321. [PubMed]. Vural S, Wang X, Guda C. Classification of breast cancer patients using somatic mutation profiles and machine learning approaches. BMC Systems Biology [PubMed]. Zhao Z, Jin VX, Huang Y, Guda C, Ruan J. (2015) Frontiers in Integrative Genomics and Translational Bioinformatics. Biomed Res Int. 2015:725491. doi: 10.1155/2015/725491 [PubMed]. Cserhati M, Pandey S, Beaudoin J J, Baccaglini, L, Guda C, Fox H S. (2015) The National NeuroAIDS Tissue Consortium (NNTC) Database: an integrated database for HIV-related studies. Database: Jul 30;2015:bav074. doi: 10.1093/database/bav074. [PubMed]. Shen R, Wang, X, Guda C. (2015) Mining functional subgraphs from cancer protein-protein interaction networks. BioMed Research International, Suppl 3:S2. doi: 10.1186/1752-0509-6-S3-S2. [PubMed]. Lakshmanan I, Seshacharyulu P, Haridas D, Rachagani S, Gupta S, Joshi S, Guda C, Jain M, Ganti AK, Ponnusamy, MP and Batra, SK. (2015) Novel HER3/MUC4 oncogenic signaling aggravates the tumorigenic phenotypes of pancreatic cancer cells. Oncotarget, Aug 28;6(25):21085-99. [PubMed]. Li Y, Wang X, Vural S, Cowan KH, Guda C. (2015) Exome analysis reveals differentially mutated gene signatures of stage, grade and subtype in breast cancers. PLoS ONE, 10(3):e0119383 [PubMed]. Mohammed A, Guda C. Application of a hierarchical enzyme classification method reveals the role of gut microbiome in human metabolism. BMC Genomics. [PubMed].